We’ll post things like the best quotes from President Obama, or video of young scientists visiting the White House for the science fair, or photos of adorable moments with Bo. We’ve got some wonky charts, too. Because to us, those are actually kind of exciting. But this is also about you. President Obama is committed to making this the most open and accessible administration in history, and our Tumblr is no exception. We want to see what you have to share: Questions you have for the White House, stories of what a policy like immigration reform means to you, or ways we can improve our Tumbling. We’re new here, and we’re all ears. The move onto Tumblr is only the latest in the progression of the White House establishing beachheads on the most popular social networks on the planet. Over the past several years, the White House digital team has used unprecedented scale of its connections on these networks to try to influence national debates on proposed laws, policies and rules, applying public engagement to politics with mixed results. Now the team will be as well as tweeting, blogging, liking , pinning and plussing. 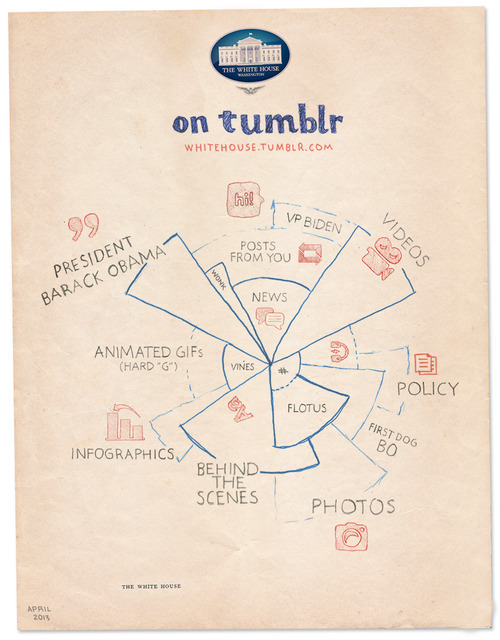 While the conventions of Tumblr will mean the way that the staffers at 1600 Pennsylvania Avenue communicates will be different than 140 character tweets, White House Hangouts or holiday pinning, the overall strategy is the same: use new media tools to go directly to the public. For a fun twist on that strategy, look no further than the White House joining Vine on the day of the White House Science Fair. I can only imagine what might have been if these tools had been around two decades ago. One detail in the first tumblr post shouldn’t go unnoticed: the White House is asking users to send them posts using Tumblr’s submission tool. If they’re anywhere near as daring with resharing submissions as they’ve been with retweets at @WhiteHouse on Twitter, many political reporters will soon be adding “reblog does not equal endorsement” to their Tumblr profiles in the days to come. As she correctly reports, however, the creators of the GIF format have long held that the correct pronunciation of GIF with a soft “G,” like “gem.” That’s how Compuserve employees pronounced it as well, back in the late 1980s. Who’s right? The GIF Pronunciation page comes down hard (er, soft?) on the side of “jif.” As noted in Wikipedia, however, where such contentious debates never fully expire, the Oxford English Dictionary and the American Heritage Dictionary. accept both pronunciations as correct. Good luck successfully navigating this debate, Mr. President. Post-Postscript: The White House made good on its promise quickly, publishing an animated GIF of President Obama brushing his shoulder off prior to his appearance at the White House Correspondent’s Dinner to Tumblr last Saturday. Other posts include three pictures, in keeping with Tumblr’s visual style, including links to the White House blog and video of the President’s comedic set from the dinner. Post-Post-Postscript: After a mechanical engineer named Claudio Ibarra commented on a Google+ thread linked to this post that he thought that staff making animated GIF was a “waste,” I explained why the White House be spending time making animated GIFs. This afternoon, I gave a talk on open data journalism at the Developing the Caribbean Conference at the University of the West Indies, Mona in Jamaica. The diGJamaica liveblog captured the discussion. Video may be available later. For now, my presentation is embedded below, with many links inside of it.